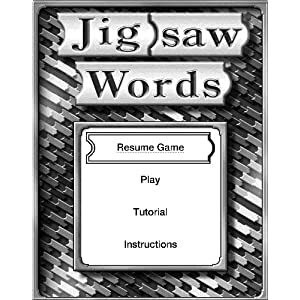 ‘Jigsaw Words (A Free Word Game for Kindle)‘ by Amazon Digital Services is available on the Amazon Kindle site for FREE! Just click here to download! Jigsaw Words is a word game that challenges you to combine groups of letters into words that match the clues given. In each Jigsaw Words puzzle, you start with a set of 10 clues. You also have a set of randomly arranged puzzle pieces with letters on them. Your goal is to solve the clues in the puzzle by arranging the puzzle pieces so that the letters form the word that matches each clue. Start with the easiest clues first. As you use each puzzle piece, it is removed from play, making it easier to find the more difficult matches. You can also shuffle the grid of puzzle pieces at any time for a different perspective. Jigsaw Words has 100 puzzles and each puzzle has 10 clues to solve. The puzzles are organized into 10 themed categories like Holidays and Animals, and you can use the theme to help you solve the clues. If you enjoy working with words and patterns, try Jigsaw Words and test your ability to build words today! Be sure to check out Amazon’s Popular Kindle Games & Active Content page for a review of all the games available! And if you want to see the top 100 apps as a bestseller list, check out the Bestsellers in Kindle Games & Active Content!